Liz Saloka is not the usual 19-year-old model. She is self-described proud nerd and graduate of Seton Keough High School where she excelled in the STEM program (Science, Technology, Engineering and Math). She found a happy place with her body and mind and is now hoping she earns her modeling career break with the Wet Seal competition. This 5-foot-3, 103-pound petite single woman with dirty blonde hair resides from Halethorpe and attends University of Maryland Baltimore County, where she is one of the few women majoring in computer engineering. She interns at Innovate Our World in Ellicott City. At Innovate Our World, she assists in the development department creating video games. She reached out to Baltimore Post Examiner to talk about her recent submission in the Wet Seal model search competition. Wet Seal is a nationwide clothing store that sells a variety of female clothes and accessories. To enter the contest, each contestant submitted an entry form and followed the Wet Seal Instagram page @WetSeal, and then uploaded her best photo using #WetSealModel15 between May 15-29. The contestants submitted their best photo on social media from the Wet Seal voting gallery, encouraging friends, family, and anyone else they knew to vote. The top 100 with the most votes became the semifinalists, with Saloka making that cut. 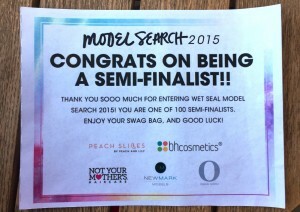 The semifinalists received a gift bag with lotion, perfume and other Wet Seal apparel. The semifinalists then were asked to submit a video, with the top 25 vote-getters making it to the next round. From there, the field will be trimmed to five. The finalists will fly to Wet Seal Headquarters in California and participate in a photo shoot and have the opportunity to sign with NewMark Models or The Osbrink Agency. Saloka submitted her video online. The voting is open from July 10 through July 24. Vote for Saloka by clicking on the here. Saloka arrived to the interview wearing a white sundress with open toe shoes. She had good posture, sitting up straight and sipped on water during the interview. We sat on the patio of a local Bean & Burgundy Bistro and discussed her journey as a model and student. BPE: How long have you been modeling? Why did you wait until college to start a modeling career? BPE: Why choose Wet Seal? How did you get involve with this competition? Saloka: I am signed up on their text alerts and I woke up one day and read the text alert about modeling contest. I decided to see where this goes, it was perfect timing because I was thinking about modeling anyway. BPE: Why do you think your video made it to the top 100? Was it based on your votes or do you think Wet Seal noticed something unique in your video compared to other contestants? Saloka: The higher number of votes I received on Instagram got me into the top 100. Family and friends are who helped me, and word of mouth from my family and friends and social media outreach. BPE: How do your parents feel about you modeling and going to school? Do they think it will take you off track? Saloka: They support me with modeling, as long as I know school comes first. My parents were worried at first because of the modeling career and the potential it has for me. But I put school first and modeling second. I know there will be more obstacles if I get into the modeling career, but I will have to balance it out. Once my parents were talking to me about it, I was getting frustrated even thinking about school and modeling. I am going into my junior year of college. If a modeling contact comes up while I am in school the first thing I will do is try to negotiate the contract, see if I can work around it while in school. But the only way I will put modeling first is if there is a once in a lifetime modeling contract that I can’t pass up. In this case I will take a year off of school, or take online classes. I am willing to compromise and work out both careers if I have to. I am not too worried. BPE: Do you have interest in working for other modeling companies? Saloka: I do have interests in working with other modeling agencies. I applied to a few already, prior to the Wet Seal contract. Model and Talent Management, PUSH Models and Wilhelmina Philadelphia. There are also thers companies that reached out to me, and wanted me to write about the STEM program and modeling. National Girls Collaborative Project , Be You, Women who Code. To me, it’s also about encouraging young ladies to go into this field. BPE: Do you have a lot of support from your school at University of Maryland Baltimore County? Saloka: I have a lot support from professors and classmates at school. I posted the information on the school Facebook website and receive a lot of encouragement. BPE: Explain STEM? Do you feel women who want to be in this program don’t have beauty and brains? Saloka: The STEM field is: Science, Technology, Engineering, Math. When I was in elementary/middle school, I was nerdy. I loved to read and received good grades. I didn’t have a lot of friends and I got made fun of. Well the friends I did have were similar to me. We weren’t the “it girls” or “the popular girls.” I absolutely hated not fitting in. At this age I told myself I was going to make myself “look pretty.” In high school, I put in contacts and got rid of my glasses. I used make up and watched make up tutorials online. At the end of my high school year I started to like the way I looked. I was in honors classes and a few AP classes. I also was getting noticed from guys. In high school, I was in a good place -I liked how I was physically and mentally. When I got to UMBC, I was happy to know it is known for its nerd culture. The students are proud of it! We have the No. 1 chess team in the state. Now, I am happy I was not popular in middle school. When I noticed people accepted me the way I was in college, I realize I didn’t have to split beauty and brains. At the end of this past school year, I encouraged people to get into the STEM program. In conversation when I tell people my major they can’t believe it because they stated “You’re hot, what do you mean you are in computer engineer major” or “Oh your note the typical computer engineering girl” This past school year I joined the society of women engineers, and center for women in technology. Both groups have chapters and work with other girls on campus and encouraging women to go into the STEM field. We have events and camps for high school to encourage them to get into this field. (In middle school it was looked down upon to be smart.) Middle School “Ascension Catholic School” Seton Keough High School. BPE: Why do you only talk about the STEM program? There are females who pursue careers in other fields and may feel the same way. Why single out females in the STEM program? Saloka: Males dominate the STEM programs, while the other programs are not dominated by men. I hear a lot of criticism while in the STEM program. In my most recent computer class I had, there were five girls and 50 guys. Another class had 50 guys and one girl. BPE: What interested you in the STEM field? Saloka: I knew when I was younger I wanted to do something with computers. My father brought computers home and broke them down in front of me. Both my parents have engineering careers. I use to play video games at a young age around 2 years old. I have been pretty involved with computers all of my life. I am pretty sure my sister wants to do the same thing with computers. BPE: How do you plan to show women you can make a difference? What are your long term goals with this modeling and obtaining a STEM program degree? Saloka: I have been in some projects with a lot of guys in class and they assume that I got the question wrong. They would second-guess my answers, or they would brush off my ideas. This discourages me and makes me feel determine to prove them wrong. This only confirms to me that we need to change the stereotype. If we got more girls into the group, guys will take girls more seriously. My ultimate career goal is to work with a computer company. I don’t know specifically where or who I want to work for. But I want a secure job, something where I can travel and have time for a side career in modeling. I don’t know if modeling is something I would stick with, but now that I am young I would like to do it, at least.